1 A psalm of David, written to get God’s attention. O Lord, do not continue to rebuke me in your anger! Do not continue to punish me in your raging fury! 2 For your arrows pierce me, and your hand presses me down. 3 My whole body is sick because of your judgment; I am deprived of health because of my sin. 4 For my sins overwhelm me; like a heavy load, they are too much for me to bear. 5 My wounds are infected and starting to smell, because of my foolish sins. 6 I am dazed and completely humiliated; all day long I walk around mourning. 7 For I am overcome with shame and my whole body is sick. 8 I am numb with pain and severely battered; I groan loudly because of the anxiety I feel. O (Observation): David is quite ashamed of what he has done. Take your pick, David. You’ve got a lot to be held accountable for. Nasty imagery, here. Stinking wounds? Battered? Groans? A (Application): And yet, each of us has been to that point, no? Broken. Without hope. But this is not the end…it is just the beginning. Even faithful God-followers can experience this pain again and again. This has nothing to do with the level of faith in our hearts. Rather, this has everything to do with the fact that we are continually being made new in our baptism in Christ. The renewal is BOTH a one-time event, and a daily event. Martin Luther, in his explanation of the Sacrament of Holy Baptism, says that the significance of our baptism is the daily drowning of the old Adam and the old Eve in each of us…making way for the new Adam and the new Eve to be born in us. That as we recognize our brokenness and come to God with a contrite heart, we walk in newness of life. We are renewed! So, like David, we come to God with our shortcomings, with our brokenness, with our imperfections. And God receives us…and makes us whole once again. 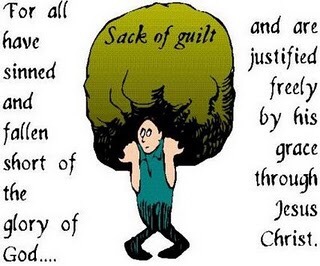 What is making you feel sick or overcome with shame or guilt this day? What ails you? Bring it to the Lord! For the Lord is gracious and merciful, abounding in steadfast love! P (Prayer): Lord, we give you thanks for the Sacrament of Holy Baptism, a blessed transformational event, affecting us daily. Amen. This entry was posted in Digging Daily and tagged Adam, Baptism, Eve, Jesus, Stink, Wound. Bookmark the permalink. ← What Do I Do With All of This Stuff?? ?